two peas & the dog: organize. juice. It's a bit wrong that I write this as Nate and I are opening our second bottle of wine for the night. Let's not think of it as wrong, more prepared. Juicing...we love it (minus the cleaning of the machine). It's actually kind of hard for me to accept store bought juice now. The layer of sugar on your tongue after throwing down a glass of store bought juice is no bueno for this wanna be blogger. 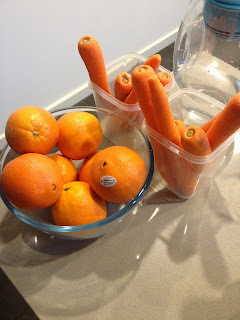 Regardless of if your two bottles of wine in or not, if you plan to make juice in the morning...prep the night before. We put the containers in the fridge and in the morning, turn on juicer, juice and do a rinse of all your pieces for the juicer. Have a juice recipe you love? Give us the recipe in the comments, we'll give it a try!